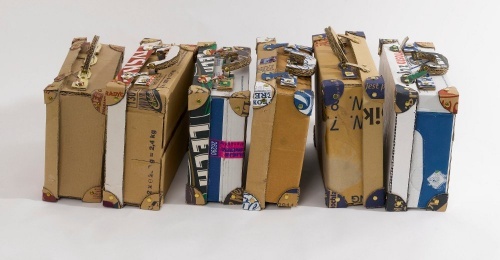 “Suitcase Series” is a year-long gallery project that plays with notions of distance, space, location interpretation and interaction. The work involves your devising of an action, activity or work that utilises, fills, alters or responds to the gallery space in some way. You then send us instructions for carrying out your plan by altering or otherwise using the gallery space, which we will undertake, set up and interpret according to the parameters set by you. The purpose of the project is for you to conceptualize the ideas in any way you like, considering that all you have at your disposal is time, an empty, potentially active space with great visibility in the centre of Edinburgh and people to follow your instructions. The project ‘Suitcase series’ is a pilot project for our gallery, set up to offer the space for use also to artists that are not locally/UK based. If your proposal is selected, you will have the space at your disposal during the opening hours of our venue, from 10am-midnight daily. While we are welcoming all kinds of proposals in all media, due to the location of our gallery in a high traffic area of the city we are particularly suited for work that involves audience participation. There is no equipment inventory attached to this project – you can treat the space as a ‘long distance terminal’ for visual or action-based investigations into the themes of the series. During the opening hours the gallery is open to both the street and the café, and while there are people at the premises at all times, the gallery is not invigilated separately, something that you need to consider while thinking about the material setup of your project. There is no deadline for the project. Please send us a proposal( by email) explaining your concept and a short artists statement. If you plan to create an installation in the space or have any special display requirements please describe your intentions in full, if possible provide supporting sketches. Do include a timeframe for your project, what you would need in terms of materials and people, and 6 good quality images of previous work, INCLUDING an image that you would like us to use for your publicity. If you must provide links to work online please link to each image individually, not just to the site they are on. Please do not provide links to sites that require a log-on to enter. A CV at this stage is not needed – we will make our selections on the basis of the content of your proposal. PLEASE NOTE: We are sorry to say we do NOT currently welcome new applications to this project. If you are interested in showing with us, please contact us through our normal application procedure. Meanwhile, check back to this space, we hope to carry on with this project in the future.